We’d love your help. 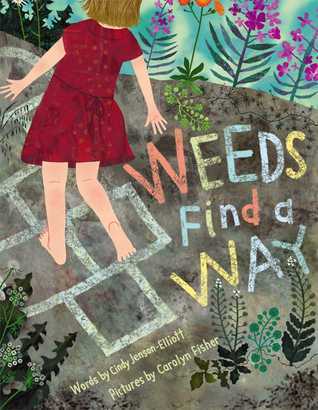 Let us know what’s wrong with this preview of Weeds Find a Way by Cindy Jenson-Elliott. From bright yellow dandelions popping through cracks in sidewalks to purple loosestrife growing rampant along roadways, weeds offer unexpected splashes of color and life to the least likely of places. With lovely language and a sly sens Weeds are wonderful! Persistent, exuberant…these plants have personalities, and this nonfiction picture book puts them on colorful display! To ask other readers questions about Weeds Find a Way, please sign up. I was into this book. The illustrations were great, and it gave a different perspective on weeds - not the view that weeds are just something you must get rid of all the time in your yard or driveway. The language in this book is lovely--and I could teach so many things about sentences from it. I love the language. It is nice, too, that more information about different kinds of weeds is given in the back of the book in informative paragraphs. Cute and informative. Easy to understand. Love the information in the back of the book. Great for elementary classrooms. This review has been hidden because it contains spoilers. To view it, click here. Weeds Find a Way is well written and colorfully illustrated. The subject matter, weeds, is shared in such a way that even I, a gardener, admire the tenacity and beauty of weeds. After all, weeds are only unwanted plants in the wrong place! Classification guide at the end will encourage readers to identify troublesome (and stubborn) weeds in their neighborhood. Jenson-Elliott, C., Fisher, C. (illustrator). (2014). Weeds Find a Way. San Diego: Beach Lane. Jensen-Elliots book is filled with stories of how weeks grow everywhere, in tough locations. They grow between cracks in the pavement and in places people don't want. The artwork is layered and sketchy. This book would be good for early readers to learn about plants and gardening. For some reason the cover never looks terribly alluring, and yet the inside is fabulous. The illustrations are rich and bold and colorful, and the text is poetic without rhyme and full of information. Kind of like weeds, I suppose: first impressions don't always give the fullest picture of the beauty and persistence and mystery inside. I really loved this book, it's about weeds and how they can grow where others can't which is really important for kids to understand that they can thrive where others can't which is something really inspiring and we should definitely be telling them that's it okay to be themselves. This book has amazing imagery! I love the brush stroke effect and all of the bright colors! I admire how informative it is is about weeds and how they are unique! Such a great book for a quick science lesson! The book pictures are very vibrant and colorful. It is a good story line. I would love this book if I was a child. Honestly didn't like it. Poor illustrations and hardly any content. Narrative picture book that shares information about weeds - how they grow; where they grow; why they are so tenacious. Don't miss the fact sheet and weed identification charts at the end. Illustrations look like they painted using perhaps a few different kinds of paints. This book is about how weeds are very successful at living in harsh conditions and the many varieties of weeds. It tells about how weeds go from seed to mature plants. The backmatter contains the common name, scientific name and more information about the weeds that were pictured in the illustrations. The illustrations! The illustrations! I was mesmerized by the gorgeous artwork in this text. As I read it aloud to my son and husband, I was oohing and aahing at the bright, luscious colors. It made me want to go outdoors and lay among the weeds. If it wasn't the dead of the winter, I would pull my son outside and read the book to him in our garden. There are beautiful passages of figurative language--alliteration that reads like a song, and readers will be sucked into the sprawling passages tha The illustrations! The illustrations! I was mesmerized by the gorgeous artwork in this text. As I read it aloud to my son and husband, I was oohing and aahing at the bright, luscious colors. It made me want to go outdoors and lay among the weeds. If it wasn't the dead of the winter, I would pull my son outside and read the book to him in our garden. There are beautiful passages of figurative language--alliteration that reads like a song, and readers will be sucked into the sprawling passages that evoke lovely images. The book turns readers' assumptions on their heads. The words and images show that we can find beauty in, of all things, weeds. While I learned much about weeds and found the informational passages at the end (about different types of weeds) to be quite informative, I found the idea of weeds to be symbolic, too. Weeds are the most tenacious of plants, growing where nothing else can survive. This informational picture book looks at how these weeds are able to live in such harsh conditions. It also explores the various ways that weeds reproduce from fluffy seeds carried on the wind to being pokey and sticky and carried along on clothes and fur. Weeds can survive scorching heat and icy cold. They fight back by having stems that break before their roots are pulled out, sour sap or thorns. But in the end, th Weeds are the most tenacious of plants, growing where nothing else can survive. This informational picture book looks at how these weeds are able to live in such harsh conditions. It also explores the various ways that weeds reproduce from fluffy seeds carried on the wind to being pokey and sticky and carried along on clothes and fur. Weeds can survive scorching heat and icy cold. They fight back by having stems that break before their roots are pulled out, sour sap or thorns. But in the end, this book is about survival and the beauty and wonder of weeds. It’s a celebration of these unwanted plants. The author has written this book in prose, but uses poetic devices like analogies and similes to show how weeds thrive. Her language choices are very nice such as her depiction of milkweed: “…shot out of tight, dry pods like confetti from a popped balloon.” Throughout the book there are descriptions like this and they bring the entire book a certain shine. Fisher’s art is standout in this book. Her illustrations are a dynamic mix of painting styles. There are layers throughout her work, some smooth and detailed, others large and textured for the backgrounds, and almost lacy weedy touches. They are strikingly lovely especially if you look at them closely, rather like the weeds they depict. A choice addition to gardening story times, this will make a good summer or spring pick to share. Appropriate for ages 3-5. Weeds Find a Way is a celebration of the tenacity and diversity of these pervasive plants we call weeds. This book explores the ways in which weeds reproduce, live in improbable and harsh environments, and bring beauty to the most unexpected of places. Cindy Jenson-Elliott's factual yet lyrical and descriptive text weaves among Carolyn Fisher's stunning mixed media and digital collage illustrations to create a powerful ode to these oft ‘misunderstood and underappreciated’ plants. Describing how weeds spread their seeds Jenson-Elliott says "Weeds send their seeds into the world in wondrous ways: fluffing up like feathers and floating away on the wind; / swirled into prickly burrs that stick to socks and fur, poking into pants and paws like tiny needles; / or shot out of tight, dry pods like confetti from a popped balloon." This poetic informational text includes back matter with extensive information about the common and scientific names of weeds, their natural habitats, interesting facts about each species and some of the important uses of weeds. Readers need only peek under the dust jacket to be rewarded with a delightful example of how beautiful and varied the foliage and flowers of weeds ‘find a way’ to be. Do your children always want to grab fiction picture books? Weeds Find a Way is a perfect example of the kind of nonfiction that will entice them to give it a try. Jenson-Elliott’s lyrical text paints vibrant, whimsical word pictures. For example, she says the bitter sap of a certain weed “…could turn a tongue inside out.” Can’t you visualize a plant bug with its beak puckered up? As a perfect complement, Fisher’s mixed media and digital collage illustrations are intriguing and playful. The bac Do your children always want to grab fiction picture books? Weeds Find a Way is a perfect example of the kind of nonfiction that will entice them to give it a try. Jenson-Elliott’s lyrical text paints vibrant, whimsical word pictures. For example, she says the bitter sap of a certain weed “…could turn a tongue inside out.” Can’t you visualize a plant bug with its beak puckered up? As a perfect complement, Fisher’s mixed media and digital collage illustrations are intriguing and playful. I was not impressed by the illustrations, which, in a picture book, do a big chunk of the narrative work. The pictures here, especially when there was a human figure involved, were muddy, messy, and just plain odd (the girl's eyes are just black spots). The most effective pictures were of fields of weeds in flower. The story that goes with the pictures, about weeds, and how their adaptations make them so ubiquitous, is fine. It's subtly rhymed, but not in a particularly controlled way, which is I was not impressed by the illustrations, which, in a picture book, do a big chunk of the narrative work. The pictures here, especially when there was a human figure involved, were muddy, messy, and just plain odd (the girl's eyes are just black spots). The most effective pictures were of fields of weeds in flower. The story that goes with the pictures, about weeds, and how their adaptations make them so ubiquitous, is fine. It's subtly rhymed, but not in a particularly controlled way, which is annoying from a compositional view, but it's unlikely that any but the most language / aurally sensitive children will notice. Who knew that weeds could be so much fun to read about? I loved reading, "Weeds find a way to stay, reaching deep with a grip so strong, the stem always breaks first…". Anyone who has weeded can relate to that! "Weeds find a way to fight, hooking tender skin with horny thorns, stinging unsuspecting tongues with invisible prickles…". It never occurred to me that I was not the only creature being hooked by thorns! But I have a love/hate relationship with weeds because I find some of them so beauti Who knew that weeds could be so much fun to read about? I loved reading, "Weeds find a way to stay, reaching deep with a grip so strong, the stem always breaks first…". Anyone who has weeded can relate to that! "Weeds find a way to fight, hooking tender skin with horny thorns, stinging unsuspecting tongues with invisible prickles…". It never occurred to me that I was not the only creature being hooked by thorns! So here's what I like about the library. You dig through all these books and you find ones that you don't think you'd ever like, but they're so interesting and they turn out to be so great, and some of them look like stories but they also have good facts in them, and they make you think about things you never even noticed before. Like this one was about weeds and how they find ways to grow everywhere. I never thought I'd like a book about weeds but I learned so much! And the pictures are pretty! So here's what I like about the library. You dig through all these books and you find ones that you don't think you'd ever like, but they're so interesting and they turn out to be so great, and some of them look like stories but they also have good facts in them, and they make you think about things you never even noticed before. Like this one was about weeds and how they find ways to grow everywhere. I never thought I'd like a book about weeds but I learned so much! And the pictures are pretty! This was a really really great one! A book that explores the tenacity weeds and variety of methods plants use for getting themselves planted in unexpected places. This would be a great nonfiction picture book to use in elementary science classes when studying seed structure and function. It highlights several different seed designs that help plants spread their population. The illustrations are bold and bright, almost to a fault. I found some pages a bit hard to focus on and/or read because of the illustrations and the font chosen A book that explores the tenacity weeds and variety of methods plants use for getting themselves planted in unexpected places. "Weeds send their seeds into the world in wondrous ways: fluffing up like feathers and floating away on the wind; swirled into prickly burrs that stick to socks and fur,..."
There are certain weeds I love, Queen Anne’s Lace, Showy Milkweed, but when I read this book, not only does Cindy Jenson-Elliott tell about the resilience and grit of weeks, Carolyn Fisher shows their beauty in her illustrations. Now I love even more! They also share extensive back matter about the weeds included in the book. For anyone who studies nature in their classrooms this will be a wonderful addition. I love this book because it looks at weeds the way children do - as beautiful. I can remember my girls when they were young being perplexed when we hated the dandelions sprouting all over our spring lawn. The beautiful language and illustrations combine to make a fascinating text about how creative weeds are. Excellent information in the back about adaptation and various weeds. I really enjoyed this book. Beautiful poetic writing and engaging illustrations drew me in right away. A good pair with "Sidewalk Flowers". Viewing something as a weed is all about perspective. Instead of viewing them as pests, we could admire their staying power, determination to grow, and true beauty. Good conversation in perspective. Weeds Finds a Way by Cindy Jenson-Elliott, pictures by Carolyn Fisher - I love when a picture book helps you look at things from another perspective, appreciate commonplace things. This book is a soft spoken, beautiful book that introduces how weeds find a way to grow in many different places. Just loved every bit of the book. Even though this was a book about Weeds; I liked it. I thought it was fascinating how the author choose to show that weeds have a way of popping up anywhere. Sometimes that are in places that you do not expect (peeking out of concrete sidewalks). The illustrations were lovely and bursting with color. I love the reference guide in the back for the different types of weeds. Fun book. Spring is the time for growing plants. Weeds come along with the flowers! I was amazed at this picture book. I was not sure about a story on weeds, but it's very informative and playful. It's a fantastic read, but weeds are all around us! Jenson-Elliot shares how weeds travel and grow and includes information in the back for more weed info.